Who’s Selling Oil Snake To Whom? If there’s one thing I can agree with Kadir Jasin, it’s the meaningless and contextless comparison of government/public debt between a developed nation like Japan and a developing nation like Malaysia. But Kadir who’s not an economist by training or by profession was making a point that Malaysia cannot afford to take more (government) debt like developed economies because our size of economy (nominal GDP) and GDP per capita as a developing economy is lower than those developed economies. Kadir is implying and portraying that Malaysia’s government financial condition is in a bad shape as Malaysia’s government debt to GDP ratio is approaching the self-imposed limit i.e 55% of GDP. As of 2nd quarter of 2016, total government debt stood at RM655.7 billion or 53.4% of our (nominal) GDP. But Japan has more people to share the debt. It has nearly 200 million compered to 24 million that we have. There’s no such thing as people “sharing” the (government) debt. Nobody who’s who’s well-versed in economics would actually talk about government debt per capita. 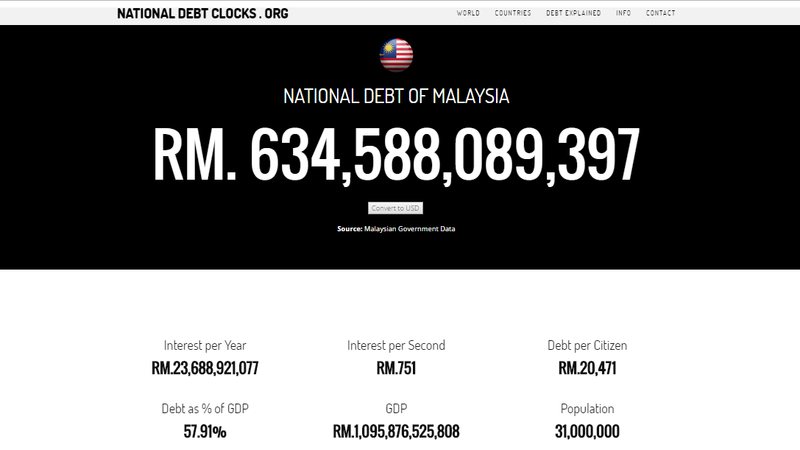 Often many people who have zero knowledge on economics and government finance share the image above and cited the “Debt per Citizen” part as if all Malaysians will have to bear the debt burden accumulated by the government. Yes, taxpayers are paying income tax, GST and other taxes to government and government uses SOME of that tax collection to pay its debt (interest payments) but not all the tax collected are utilized to pay government debt. From the chart above, Malaysia’s government collected total taxes (taxes only) of RM134 billion — RM165 billion from 2011 to 2015.
and the government spent RM17 billion to RM24 billion every year since 2011 to service its debt in the form of interest payments. It’s wrong to say all of our taxes collected by the government are used to pay government debt. Only around 10% was spent towards interest payments while the rest is to fund other government operating expenditure such as salary of civil servants, subsidies, asset purchases and many more. The claim that every citizen will have to “share” or bear the burden of government debt is a false claim. Where did the money come from? Was it from tax collected from Malaysians? Not really. Government can always issue new bonds (debt) to redeem any maturing debt. Every sovereign government in the world redeems its debt using the proceeds from a new debt issuance. In 2015, government received RM115.80 billion of proceeds from debt issuance (Malaysian Government Securities, Government Investment Issues) and redeemed RM77.62 billion of its matured debt. 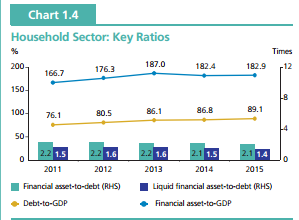 So net debt (Debt Issuance net off Debt Redemption) added in 2015 was RM38.18 billion. Other developed countries are also highly indebted partly because lenders are willing to lend them money to them at lower interest rates than when they lend to the developing countries. In the case of Japan, most of its borrowings were domestic. Apart from lenders’ willingness to lend to Japan at lower interest rates, Kadir “forgot” to mention that Japan’s ultra-low interest rate of its government debt was a result from ultra-easy monetary policy (ZIRP, NIRP, QE) by its Central Bank, Bank of Japan (BoJ) in order to boost the Japan’s economy and to get Japan out of deflation trap. BoJ has been purchasing its own government debt as part of its monetary policy to ease monetary conditions which they hope could create inflationary pressure and boost its economic growth. Yes, its own central bank is buying its own debt. Almost all developed economy central banks in the US, UK and Europe (Eurozone, Switzerland, Sweden, Denmark) have purchased and still purchasing their own government debt as part of their monetary easing measures which is called Quantitative Easing or in short “QE”. Which is why we are seeing low to ultra low to negative yields on US, UK, Eurozone, Japan, Switzerland government bonds. In the case of Malaysia, non-resident or foreign investors hold around RM232 billion 34.1% of outstanding (Ringgit denominated) government debt. 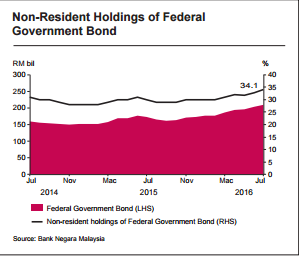 If government financial position is in a dire condition, why would foreign investors keep purchasing Malaysia’s government debt? 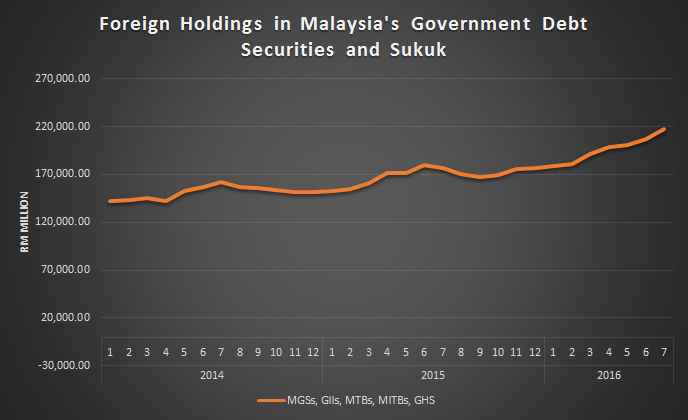 Why are foreign holdings in Malaysia’s government debt securities (MGS) and sukuk (GII) keep increasing every month? If Kadir’s right, foreign investors wouldn’t want to purchase or invest in Malaysia’s government securities for fear of not being repaid by the debt issuer (Malaysia’s government). Government’s ability to service and repay its own debt without fail has instilled high confidence among foreign investors in Malaysia’s government debt. 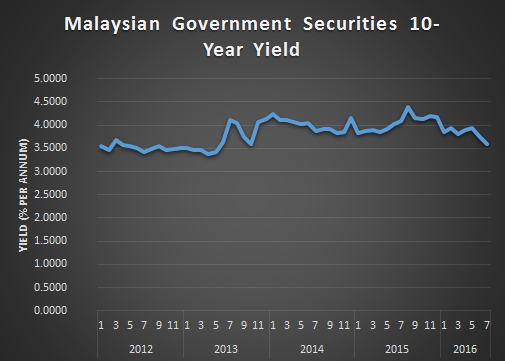 Yield on benchmark for Malaysia’s government bond, 10-Year Malaysian Government Securities (MGS) have been stable for many years despite challenging external events like taper tantrum (Federal Reserves’s QE reduction), reversal of capital flows from emerging markets to advanced markets and plunge in commodities e.g. crude oil, LNG, crude palm oil, rubber etc. During 1986 recession, the government cut ministers’ salaries and froze the salaries of civil servants. All were required to sacrifice. You can’t ask the ordinary rakyat to sacrifice when politicians and civil servants are treated favourably. I don’t know about you, but I don’t think a cut in ministers’ salaries would actually “help” anything? How much could government actually save from a cut in minister’s salary? And what is this about a freeze on salary increments for civil servants? It costs the government only RM1.1 billion (which is less than 1% of government’s annual budget) for the 1.6 million civil servants to get a long awaited pay bump. Does Kadir Jasin think it’s not appropriate for the government to invest on the civil servants who are a backbone to this country’s administration? Not only that government debt is high — equivalent to almost 55 per cent of the GDP — the people too are badly indebted. Our household debt is among highest in the world. Does the government force Malaysian households to borrow? Does it force the people to take up loan to buy their dream cars and home? Does it encourage people to spend beyond their means using credit cards? Why do people like Kadir love to quote the household debt to GDP ratio and overlook the fact that Malaysian households financial assets are two times of their debt? Does Kadir know that Malaysian household financial assets to GDP stood at 182.9% to GDP? Yes, Malaysian households on average are solvent and can pay their debts if the creditors (banks) suddenly demand them to fully repay their loans. 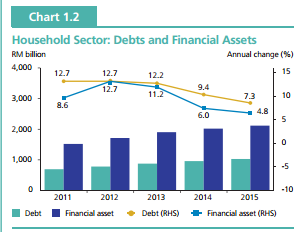 As stated in the graphic above household debt annual growth has slowed due to macroprudential measures (stricter lending rules, cap on maximum tenure for car and housing loans, limits on the credit limit and number of credit cards held by those who earn below RM36,000 per annum) introduced by BNM. In reality, most rakyat are not concerned with high GDP and good rating. They don’t understand and they don’t care. They are concerned about the bread and butter issues of daily existence — the rising cost living, unemployment, their children not getting Mara study loans and Khazanah scholarships being awarded to children of politicians and rich people. I’m amused by this oblivious self-contradiction by Kadir. In his blog and Sinar Harian weekly column, he’s been harping on slowing GDP growth, slowest GDP growth rate in ASEAN, government debt to GDP and so on but here he said most rakyat aren’t concerned with high GDP. Kadir needs to make up his mind. They are angry that everything has gone up in prices and in the midst of all that Mohd Najib went ahead with the implementation of the good and services tax (GST). Now everybody has to pay tax and has less money to spend. And when they don’t spend, Mohd Najib has less GST to collect. It’s a vicious cycle. The challenge is to break this cycle. Taking the money from everybody and redistributing it to some through 1Malaysia Peoples Assistance (BR1M) does not appear to improve the sustainability of the economy. Not everything has gone up in prices and even after the implementation of GST not everything had gone up in prices as Kadir claimed. Food (and non alcoholic beverages) annual inflation has always been around 4–5% every month pre or post-GST because all people consume food every day. Food price changes depend on demand and supply, seasonal effects such as festival month, weather, flood etc. Besides most essential food e.g. rice, bread, fruits and vegetables are categorized under GST zero-rated items which means there’s no GST on essential food. 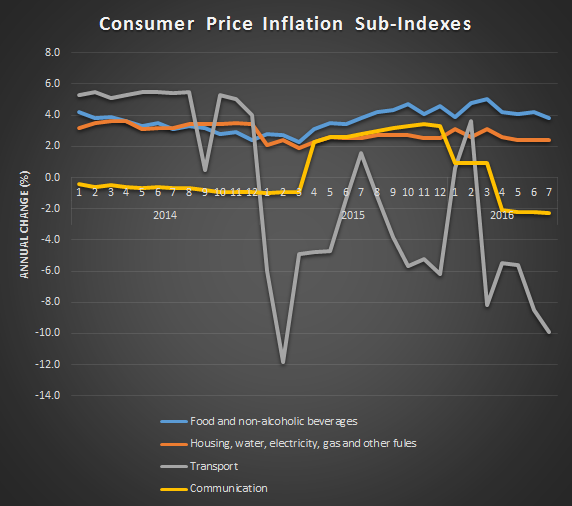 Transport price inflation has been volatile and mostly down due to the falling crude oil price. Cheaper petrol and diesel enjoyed by the Malaysians consumer partly because of Najib’s decision to abolish the fixed fuel subsidy regime to managed floating regime. But still not everything has gone up like Kadir claimed. While telecommunication inflation had a bump after GST implementation, it’s gone down to deflation mode this year thanks to the competition among the telcos. And lastly, the housing, water, electricity and gas inflation has also been registering steady growth before and after GST. So it’s up to you readers to decide whether you want to believe anecdotal evidence by Kadir or statistical evidence provided by our own Department of Statistics Malaysia. You have to admit though, not everything has gone up in prices and that if you’re being honest to yourself. BR1M was first introduced by Najib after the reduction in fuel subsidy in 2012. It’s only logical for Najib to do so because the lower income group weren’t the ones who enjoyed the generous ten of billions in fuel subsidies every year. Those who could afford luxury and sporty cars enjoyed the huge chunk of fuel subsidy more than those low income earners who probably just ride a motorcycle or don’t have any vehicles at all. Close to 7 million households and single individuals have benefitted from the BR1M program and why would anyone want to question this well thought government policy? 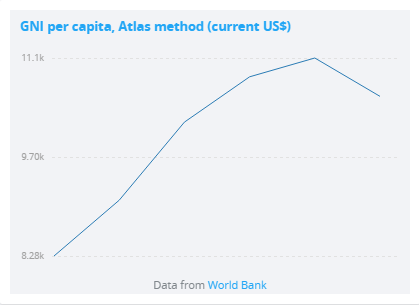 If growth were the measure of a country’s success, then Angola and Equatorial Guinea, where growth used to be 30 to 40 per cent, would be the most successful countries in the world. But their people are among the poorest. In economics there’s this hypothesis called “convergence” of which the idea is that poorer (developing) economies tend to record faster economic growth rates than the richer (developed) economies. This is because developing economies started from a low base, small economic size and they have low diminishing returns to capital compared to developed economies. That’s why most countries in Africa, some countries in Southeast Asia like Myanmar, Laos, Cambodia grew at faster rate than say Singapore, Japan, Hong Kong etc. That’s also why Singapore has slower growth rate than Malaysia and those frontier newly developing economies in ASEAN are growing faster than Malaysia. And of course their GDP per capita and household income are low compared to developed economies just like Malaysia to Japan. Malaysia’s GDP growth rates are faster than Japan’s but Japan GDP per capita is three time the size of Malaysia’s. Growth does not reflect the true state of a country’s economy these days. There are other factors that have to be taken into account. Distribution of wealth is more important. But our wealth distribution has been on the decline for the past decade and inequality is widening. I don’t want to be repetitive here. I have touched on wealth redistribution particularly on BR1M which is also a wealth redistribution policy spearheaded by Najib. But Kadir’s claim on widening inequality is factually inaccurate. 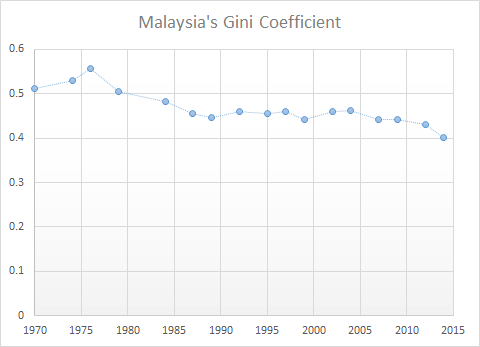 Gini Coefficient which is the most commonly used measure of inequality shows that inequality in Malaysia has actually decreasing. The lower the coefficient the more equal the income distribution of a nation’s resident. 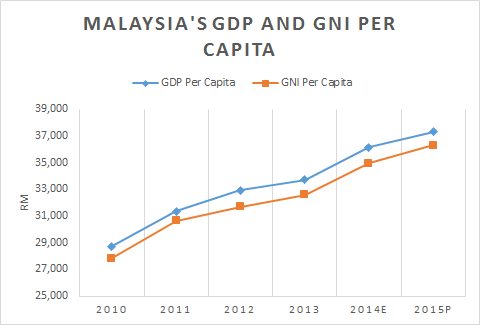 In fact under Najib, Malaysia’s Gini Coefficient fell to its record lowest of 0.401 from 0.441 when he took over the country’s administration from Pak Lah. The government claims we have escaped the middle-income trap and on the way to becoming a high-income country by 2020. Would the people who are selling the high-income snake oil dare deny that our per capita GDP has in fact declined — from US$9,766 in 2014 to US$9,291 last year and US$8,821 so far this year? Yes our GNI and GDP per capita in US Dollar term has declined as Kadir claimed but it’s not due to an economic contraction or slower growth. It’s due to the depreciation of Ringgit against the greenback. 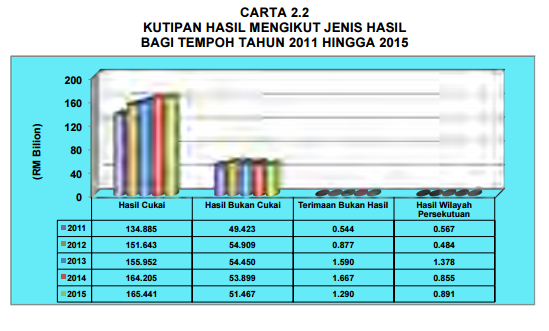 In Ringgit term our GDP per capita is still growing RM34,964 in 2014 to RM36,299 last year. Most Malaysians earn and spend in Ringgit. They draw their salary and wages in Ringgit. They spend on groceries and pay their loans in Ringgit. So tell me why on earth should we care about our GDP per capita in other currency than Ringgit? Kadir is throwing everything towards Najib and the government to discredit their achievements. Some of the gullible Malaysians might believe him but I trust the well-informed Malaysians will at least check all the facts that have been claimed by Kadir. It’s obvious that Kadir is stepping up his attack on the current admin on behalf of Mahathir and his newly formed party. But Kadir’s wild and baseless allegations coupled with his economic illiteracy can easily be rebutted by hard facts and statistics compiled by the well established agencies. One advice for Kadir Jasin, enough of selling the snake oil.